Many holiday celebrations incorporate sharing a meal amongst members of a community, big or small. Food can serve as a beautiful way to bond and to unite. In fact, there may even be an evolutionary basis to the concept that food is love. Several types of monkeys have been observed to use food in order to strengthen social bonds with other monkeys both within and outside of their kinship network (Hamilton, 2013). 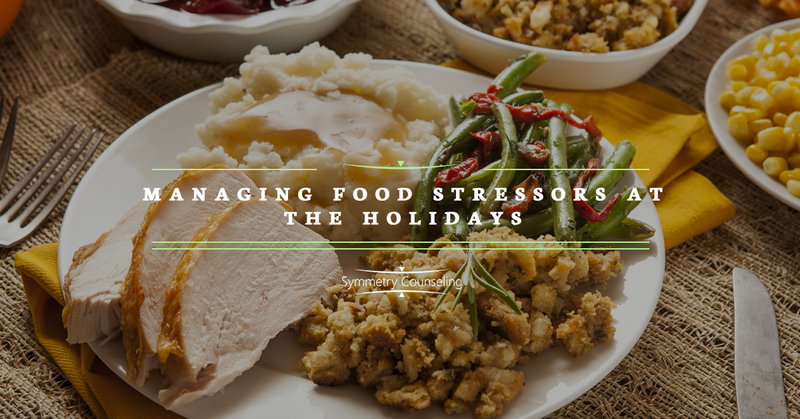 Yet for those struggling to maintain a balanced relationship with food, holiday celebrations can be especially worrisome. Whether you’re trying to grow out of a restrictive diet or hoping to avoid overeating, there are strategies which can help to make this holiday season the most enjoyable yet. Those who have had a highly restrictive diet may find the options available at a communal meal to be overwhelming. If possible, try to ask the host what will be served so that you can mentally prepare for the options. Identify foods which respectively feel safe, moderately challenging, and scary. Using these classifications, build your plate according to percentages which are appropriate for you and have been approved by your doctor, therapist, or dietitian. For example, foods considered safe may constitute 50% of the meal, moderately challenging might make up 30%, and scary foods would be 20%. Ensure that you have access to in-the-moment self-soothing strategies such as a calming scent, mints or gum, a picture of your favorite pet, or a motivating quote. Keep your purpose for challenging rigid thinking at the forefront of your mind to help you stay motivated. A multitude of options and a cultural expectation of excess can be highly triggering for those hoping to avoid overeating. As with those on the other side of the spectrum, going in with a plan is essential. Identify the foods which are likely to give you the most trouble. Conduct an honest reflection to determine whether or not you actually can eat a moderated amount of that particular food. Regarding most compulsive behavior, some are able to moderate the behavior to avoid unwanted consequences while others find this feat impossible. Clarity could help to set realistic goals and avoid future disappointment. Practice mindfulness strategies to avoid eating quickly, such as placing your fork back on the table in between each bite or making sure you have fully swallowed each bite before taking another. For many, the idea that a holiday meal is a scarce commodity also promotes a reactive response. Give yourself permission ahead of time to ask to leftovers, request the recipe, or have your own version of a holiday meal at a later date. Remember that this will not be the only time you have access to these foods and, if you have a craving later on, there are other ways of satisfying it. Whatever the particular behavior you wish to challenge, it is helpful to have at least one person who is aware of your struggle and your goals. Ideally this person would also be in attendance at the event although, in a pinch, someone available via phone could also suffice. Pick someone who you trust can hold you accountable and has been invested in your wellness. Food related issues often have deeper connections to the way we think, feel, process, communicate, and relate, so it might be wise to consider counseling to ensure underlying issues do not go unaddressed. We believe in you! Let us know if we can help by contacting our office today.